I feel the time has come to bid a dignified farewell to this blog that I have lovingly labored on for many a year. Between the dopamine-fueled attractions of 140 character quickfire tweets, and the chronic lack of time for writing the far more detailed posts demanded as part and parcel of writing not one but two blogs in an era of accelerated historical change, I have come to the conclusion that continuing with Da Russophile is unrealistic. It’s pointless to go seven months without posting and still pretend you are blogging. With the failure to give Da Russophile a new lease of life by inviting in guest authors – exclusively due to my own lack of energy for such a reorganization – I believe it’s time to put the final capstone on what has hitherto been a major part of my intellectual life. Commentators – on the whole, you’ve been absolutely great. You were indispensable in creating, feeding, and grooming this little critter for the seven glorious years of its existence. 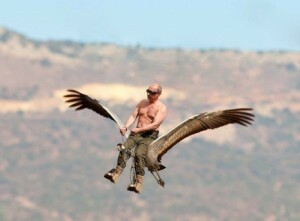 If not for your support and feedback, I’d have been done with Russia blogging within my first seven weeks. Thank you for all the time and mindpower you invested into the discussions here. No doubt you will have many questions of me at this point. I will try to answer them as best I can. Is the blog going to remain online? Of course! I have spent far too much time on Da Russophile to just throw it all away, and far too many people appreciate having the old posts around for me to deprive them of it in good consciousness. Moreover, I have spent the past two evenings compiling a comprehensive, thematically organized archive of all the better posts ever published on this blog: START HERE. Will there be any new posts? As a matter of fact, yes. About three. In the next few days, I will publish a much-requested Russia demographic update; a compilation of my Ukraine coverage as the conflict there moved from a standoff in the Crimea to war in the Donbass; and an overall “summing up” post dealing with how well (or poorly) Russia has performed since I first started started to challenge the Western consensus on Russia as a “weak,” “dying,” and “finished” country. After that, Da Russophile will enter “archive mode.” There might be a few new posts, but only to inform anyone still following of major new updates, e.g. if I ever finally finish writing and publish Dark Lord of the Kremlin. What’s the plan with Dark Lord, anyway? It was just about 40% done, at least the first draft, but history began to move too fast this year for the pen to keep pace. Between this and real life demands, I feel that shelving it until the next round of Russia’s Presidential elections is the most prudent course of action. What happened with the The Russian Spectrum, that site you had for English translations from the Russian media? It was always only going to be sustainable if it could attract funding to support a sizable group of translators. Suffice to say, funding was not forthcoming despite my best efforts, and running it is beyond one person, even if he had the privilege to do it as a full-time hobby. Which I don’t. Of course I have no intention of bringing to naught the labor of the amateur translators who extended their own time and energy to contribute to this project, so I have migrated all the posts at The Russian Spectrum to this blog together with their appropriate author attributions. These posts from The Russian Spectrum now constitute an eponymous “special series” within the general category of “Translations,” and a few dozen of the best translations are listed here. Will you continue writing about Russia? 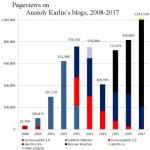 I will continue blogging at my main website, AKarlin.com, on the various topics that interest me: World history, transhumanism, evolutionary psychology, psychometrics, geopolitics, and… and… Russia. And I will continue pursuing journalistic or even academic projects relating to Russia as opportunities arise. As I said, if there are major new developments on this front, I will post an update here as well as at the AKarlin blog and on my social media accounts. Speaking of which… feel free to follow @akarlin88 on Twitter, and Subscribe to me on Facebook (nothing personal… but please don’t Friend me unless I know you). Which Russia watchers should I follow now? I will be brief, since too many suggestions can quickly become counterproductive. 1) Russia Resources – One of my key arguments has always been that statistics and opinion polls – constituting as they do massive aggregations of useful and generally reliable data – are far more useful for understanding social and political phenomena than the opinionated and fallible Bildungsphilister that you see quacking in the MSM. So you could do a lot worse than spending some time at Rosstat and the Levada Center. Ideally, they would be complemented by something like The Russian Spectrum, to give you a detailed insight into the state of public debate in Russia, but this was not to be. 2) Russia News – RT, RIA, Voice of Russia for the “official” Russian line. David Johnson at the JRL goes out of his way to make sure both sides of the story are represented in his news selections (so much so that he pissed off the folks at Buzzfeed). Finally, it is well worth checking out Charles Bausmann’s new project Russia Insider. Its style, for the most part, is more emotive than cerebral, but on the plus side, many of your favorite Russia pundits like Alexander Mercouris, Eric Kraus, and Patrick Armstrong are actively involved with it. 3) Russia Blogs – Leos Tomicek; Mark Chapman; Sean Guillory; Mark Adomanis; Andras Toth-Czifra; The Vineyard of the Saker; Slavyangrad; and, if you understand French, Alexandre Latsa. On the chance that you read Russian, I recommend Sergey Zhuravlev, Maxim Kononenko, Colonel Cassad. 4) Forums – Though I’d really like to recommend The Russia Debate, the forum that I created and Jose Moreira was kind enough to take over, it appears to be pretty much dead at this point. Feel free to try to revive it, if not… some good discussions can be had on /r/russia and /r/UkrainianConflict. 5) Russia Watchers – In today’s world of interconnected social media, news is fast moving from the realm of big vertical providers to a much more personalistic and horizontal level. On Twitter and/or Facebook, these people/accounts are well worth following: Alexander Mercouris, Graham Phillips, Eric Kraus, Jon Hellevig, Patrick Armstrong, Ben Aris, Mark Sleboda, Alexander Dugin, Vladimir Suchan, Mark Adomanis, Leos Tomicek, Sean Guillory, Dmitry Trenin, Jake Rudnitsky, Mark Schrad, Alec Luhn, Dmitry Linnik, Bryan McDonald, Gleb Bazov, Egor Prosvirnin, Maxim Kononenko, Natalia Antonova, Maxim Eristavi, Simon Ostrovsky, @southfronteng, @euromaidan, @noclador, @anti_maydan, @IndependentKrym, @UkrToday… and your own humble servant, @akarlin88. This is just a solid, #FF-style list to get you started and is in no way meant to be comprehensive; some of them are, for that matter, actively anti-Russian, on the logic that it’s well worth hearing what the “enemy” has to say in any case. The beauty of such an approach is that you can quickly start building your own information network.